Now that December has finally come, I’m going back to writing the fictional storylines I so love to do. My REALITY stories are sometimes too depressing to write about and takes me down a darker path, perceiving the human race as an uncontrollable virus. How our human race has acted throughout our historical existence is the reason I wrote BLACK ANGELS. It’s on the belief our human race was genetically altered, creating who we are today. If evolution had taken the same path for another million years, it’s possible our race of human beings might of been passive peaceful creatures. However, as it stands, our so called civilization is plagued with rage, depression and entitlement, forming us into to these callous beings of monsters where a human being has no value. We are indeed an anger species. It’s true, I have a dim view of our human race, but let’s carry on to my storyline of BLACK ANGELS, where our dreams lay. My science-fiction story begins with the historical hypothesis, the Dogon people from west Africa are responsible in revealing the existence of the Syrian Gods from the Heavens. The Syrian Gods came to earth creating a new hybrid species called Homo sapiens, crossing their genetic with our ancestral Denisovan species. In the beginning, two different species were created from the Denisovan hominin. The Neanderthals and the Homo sapiens. The worldly scriptures are a testament of our gods and how they were responsible for teaching us a better way of life, but slowly we grew into an uncontrollable bloodthirsty race we are today. The Syrian Gods were appalled by our savage instincts. On the outside we appear as a kind respectable species, while underneath we all wore the persona of the most scariest monster, deemed capable of the darkest deeds. Our creators became fearful of the detestable creatures we turned out to be. They even went as far as to completely decimate our population by a worldwide flood. In time, it didn’t matter how many times our creators tried to correct the problem, we only got worse. It came to a point our creators fled earth overwhelmed by us Homo sapiens, filling the earth like a deadly virus. Their experiment didn’t work out so well and maybe, simply moved on. Interesting, like suggest in the movie Prometheus, it may be our planet and species were considered an outcast and before they were about to carry out their deadly destruction onto our species, something went dreadfully wrong. The famous lost city of Atlantis which was believed to be swallowed up by the sea. It also is speculated, the floating Atlantis may so happen have been a fleet of extraterrestrial Spacecrafts, who eventually left earth. Another version is the lost continent of Lemuria, believed to have existed in the middle of the Pacific Ocean, according to the Polynesians, who tell stories of the “Legend of Mu”. The War Lords who occupied it were considered out-of-this-world gods. The other legend is still read today in the Old Testament of the Bible. It’s a time when Giants walked the earth with us. It was also recorded of a possible war against the gods themselves. Not only were the gods fearful of us, they had their own political problems. From African, Aztec, Celtic, Hindu to Chinese mythology, there are written scriptures reporting the Great Wars of the Gods over cities and continents. A fierce war causing complete devastation to cities as the Gods of the Heavens went to war. From as early as 3200 BC, Egyptian hieroglyphics record the gods and goddesses from the heavens who came to earth as Pharaohs, building incredible Pyramid structures in a short time. An impossible feat even with today’s technology. After the gods left, human Pharaohs tried their best to copy their ancestors, but they failed miserably. Whatever happened to our ancestors, they left in a hurry. But they did leave behind incredible artifacts our scientists are still try to solve using the most prehistoric method of them all, to explain them. After all, it’s just not possible our species are a remnant of past genetic manipulation. That would mean we aren’t the soul property of one spiritual GOD. Whatever you do, don’t tell the Dogon tribe their centuries upon centuries of folklore is wrong. Don’t tell them they didn’t know about the Sirius system before any astronomers had any indication they even existed. According to the Dogon people their ancestors gods told them about the Sirius star system, including the dwarfs star, Sirius B, only to be discovered later in 1862. Even though in 1844 the German astronomer Friedrich Bessel had suspected something strange was going on, it couldn’t be proven conclusively. The Dogon tribe knew centuries before any other astronomer ever suspected there were a number of anomalies in the present system. Interesting, the Dogon people also tell a story where there was a third star, called Sirius C. According to their gods, this star was hard to see in our universal sky, as it was a black dwarf. In 1922, astronomers explored this possibility but couldn’t verify it. To this day, the idea of Sirius having a triple star system is still under serious observation. Amazingly, passed down from generation to generation, the Dogon people tell the same story about having first contact with an intelligent alien being from the Sirius star system. Astronomers and past explores only thought of their story as a simple folklore by a primitive tribe. But when they found Sirius B they were loss for words. The day astronomers discover the black dwarf star known as Sirius C, they will be even more baffled. My story BLACK ANGELS is a screenplay based on the Syrian Gods historical accounts. The same artifacts that were so brutally destroyed by a sect group of savage killers. Yes, our human race is such a peaceful species – NOT! If we don’t kill off ourselves first, just maybe human beings will eventually evolve into a peaceful breed of Homo sapiens. And that’s on the assumption our earth isn’t destroyed by another extinction, like the dinosaurs were, in three separate devastating events. If Steven Hawking is correct, we have (at best) one thousand years left, before our ultimate extinction. Will we be constantly plagued by our own politics and religious beliefs, preventing us from survival? Don’t wait too long, as time is ticking away, as we speak. PS I started writing my script in 1979, and after hundreds of drafts, I finally finished it a few years ago. It was my first script and quite the learning curve, I must say. Since then I’ve written dozens of screenplays. 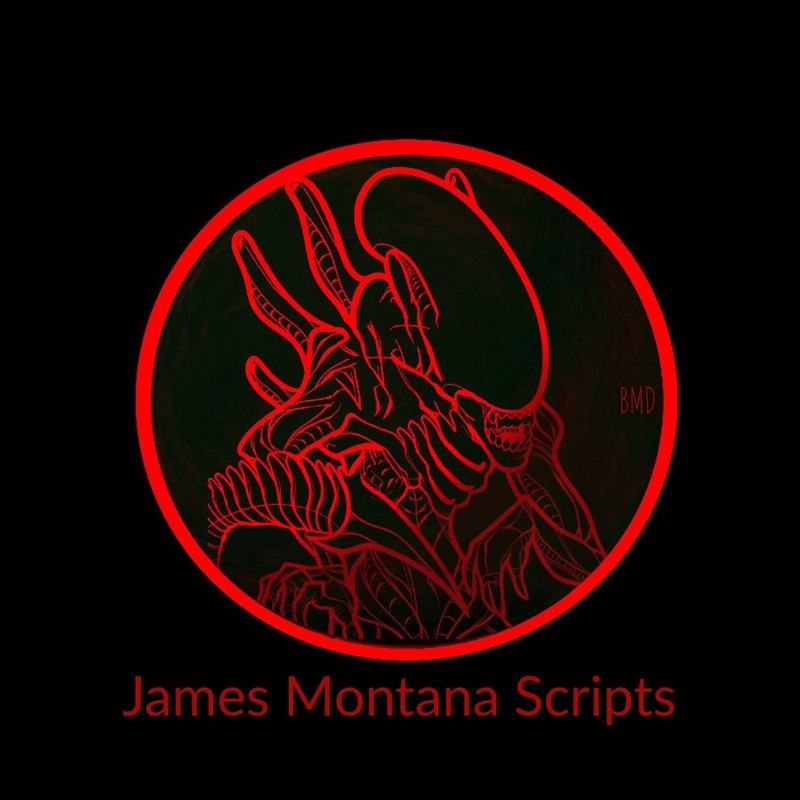 Have a look for yourself under JAMES MONTANA SCRIPTS. My next story will be the arrival on Mars, as a rogue explorer takes on NASA, defying the odds and becoming the first person to step foot on Mars. Please join me by following my stories here and if you’re on twitter, join me there as well.